[A]fter spent time looking for various information on the internet finally i am able to combine Entity framework and MySql to work together, yeayy!. 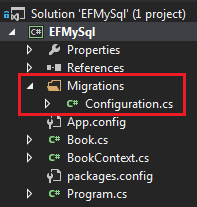 This blog post is for you who are having trouble in making Entity framework works with MySql. I’m using Code First approach in this tutorial and also i create simple console application for the demo, follow below steps and you are ready to use Entity framework using MySql. Open Package Manager Console (Tools=> Library Package Manager => Package Manager Console), install entity framework for MySql. Before add connection string make sure that you have created MySql database. On App.config add below setting as first child of configuration tag. Create model class that you will be using, for example i’m using Book. Next step is we define a context class that inherit DbCOntext. If you have reached this step it does mean that you have finished setting up. Now, we will make sure that it is working by try to do migration. This command will enable us to create migration. Take a look at Solution explorer, you will see that a folder and a class are added. You will see in solution explorer that a file named 201502030435328_InitialCreate.cs is created. Final step is run below command to update our database so that it has table for our model. 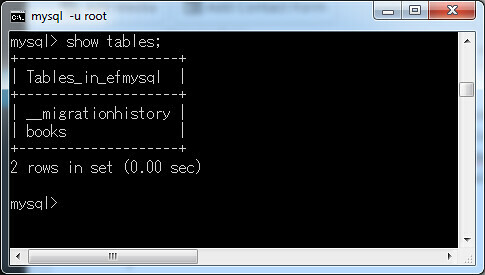 Check your database, you should see that books table has been created for you. By now you can use Entity framework to do CRUD operation. code first yo mas.. yang ambil dr db nya mysql ada ndak? maksudnya generate EF-nya dari database yang sudah ada?